Hin's Photo Corner: Pentax K-xC Plan Revealed -- Request to Pentax Corp.
Pentax K-xC Plan Revealed -- Request to Pentax Corp. The color selection from Japan is mind boggling and I hope it gets noticed and cheer on the positive momentum not even seen in the recent substantial major releases of Pentax k-7 and Pentax K20D. Both are outstanding leap of advances in APS-C cameras in the Pentaxian community. Now, I can't decide on white versus the blue. Oh my Gosh, maybe Rice High will blog about how bad Pentax does on the coloring schemes. And he will likely launch a campaign in his blog to solicit voting from how odd Pentax throw this color scheme at consumers. He may file lawsuit on color blindness from the K-x launch. But for me, how many K-x will I get tempted to buy. I am pretty darn sure that it is over one. A request to Pentax Corp., can we make it BUTTONIZED feature so that a menu is popped up on demand to choose color for body and grip. And color liquid metallic body will activate in 0.02 seconds with the chosen color. K-x color scheme can default to user defined criteria set on temperature, lens mounted, scene detected, and mood swing detection, along with Pentanic Random modules with an open API for the Pentax Tech Savy and Pentax Hacker Community. The default preferred facelift on-demand color include sliver limited, black limited, m42 oddies, Zeiss glass suitable, camouflage green, RiceHigh trashy green, Canon white L look alike, Nikonian DarkForce, White Trooper Call, Sub-zero Color White, Red-hot Mars landing among others. That is the next Pentax K-xC to die for. If you look at PentaxForums RH profile , I actually extend my friendship to him. He has since left the PF just like usual in all other forums. I really like him on his in-depth analysis and his initial enthusiasm on Pentax k-7. I consider him as a great resources and friend who are unique. But he chose again to go on his WORST human side in accusing Pentax for every single negative opinions that he and others can think, dream, buzz around and talk about. But his continued bias and echo of Pentax issues are beyond what anyone can imagine that does more harm than good to the Pentax community. Unfortunately, people including myself love bashing and rumors. I am here to SAY NO to Rumors and SAY NO to RH for his completely biased and negative views which blind sighted the entire Pentax community by repeating every single thread of discussion in the internet that has an issue related to Pentax. He is the echo of every negative thoughts and potential negative opinions and as a result, issues and known problems are magnified 10+ if not more. Negative thoughts spread like cancer with no cure. We can only stop it by SAYING NO to rumors and SAYING NO to RH. Please make the color choice an international and global choice. We are the world and Pentax serves the world with no boundaries. I just went to the Japanese site. The silver choice really looks good. Try the grey grip on the navy, I think you'll like that too. Another must-have feature: Alternate color schemes depending on who holds it. Camera flashes yellow and orange if an unknown person handles it. "Pentax serve the world with no boundaries"
Can you please ask Mr Pentax is we can have pentax at the same price here in the UK as in the US please,...and not TWICE the price as currently!!! Mis, who is not crazy in the masses buying Canikon instead of Pentax. And that include you and me thinking of Canikon all the time. i'm a digital baby having a k200d as my first serious camera. previous camera was a canon P&S which was really a POS now that i look back. that being said, i think pentax has a great history of making excellent cameras from film to digital. it is just unfortunate that they are behind in terms of positioning and company resources, their reputation only further threatened by their alleged QC issues. 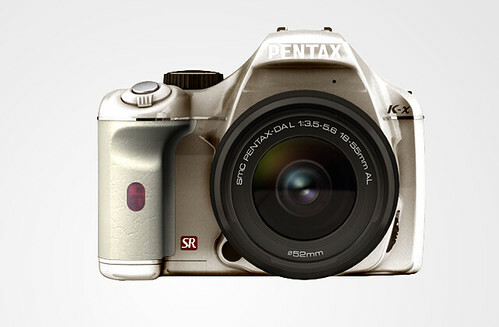 i digress, as the pentax japan camera color simulator gives a good chance of seeing what a modern dslr would look like in pentax's familiar champagne motif. reminds me so much of the mz-50, which i have due to getting the lens it came with. maybe i should shoot film one day. Came here from your self promotion at Ned's blog. Your site is pleasant surprise. I too would love to have all those colors. It seems to me that for the same money, a K20D + K-x is better than one K-7. I hate the kit lens though. I would get the 40 f/2.8 or the 43 f/1.9 limited if I ever get a K-x from Japan. -- Your friendly neighbor in Fremont. Hin, I just came from PF where I read a disturbing thread that basically said that even though the K7 had gotten a "Highly Recommended" rating from DPReview, there are some people that still aren't happy (they may never be happy with anything!). I have a theory as to why this may be the case. I suspect that there's a disease that's going around. It's name is RH-tis. The most obvious symptom is chronic malcontent with one's camera gear and/or mount. No matter what new and improved offerings that their mount presents in the way or bodies and lenses, they can never be satisfied, yet they refuse to switch to a mount that will better meet their needs. As the disease progresses, you will find them spreading their malcontented negative venom to others, most commonly via photography-related forums (i.e. PentaxForums), thus agitating otherwise contented and happy photographers. At it's worst, the malcontent will spread to other areas of an infected person's life, thus making them a royal pain in the you-know-what to deal with, in general. As of yet, no known cure exists. love the white and red, it is the color of my flag! hehuehue. Silver looks great as well.